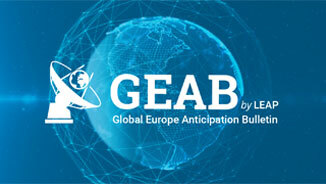 Home Les bulletins GEAB GEAB 87 Europe 2020 – Community or empire? This title is inspired by Franck Biancheri first book (unpublished) written in 1992 and in which the author showed that the founding principles of the European project conceived at the end of the Second World War (a community of countries giving themselves the means to jointly build a lasting peace and a prosperous continent) could, if one were not careful, find themselves marginalised and the well-known reflexes of a Europe-empire (European colonisation, Napoleon, Hitler…) would get back on top. In this case Franck Biancheri believed that what would allow the European construction process to stay on the community track would be its democratisation. A few years later, with the Maastricht Treaty which renamed the European Community the “European Union”Franck Biancheri, with his distrust of “unions” of all kinds, felt that this choice wasn’t very auspicious. 23 years later nothing has advanced on Europe’s democratisation front and the crisis provides a favourable context for the complete derailment of the community project. We will show which indicators enable us to say that this trend (which has always been there of course, but framed in a relatively efficient mechanism of safeguards) is in the process of re-emerging. But we refuse to put forward a final anticipation yet, preferring to focus on other indicators, as well, those which still enable us to believe that the trend will turn round (1). If we speak of a“trend turnround” it’s that, after having spent almost a year watching Europe at the “Crossroads” (2) we consider that this summer’s end marks its commitment to the wrong path, that which leads towards the “tragic scenario” described by Franck Biancheri in his visionary work “The World Crisis: The Path to the World Afterwards“ (3) in which he put forward Europe’s considerable advantages in the face of the crisis and its potential to participate in the emergence of a “world afterwards” as desirable; but also the major risk for Europe and the Europeans that their rulling elite, undemocratic (in Brussels) or non-European (in the capitals), proves to be incapable of building on the crisis to complete this still unfinished positive European construction project (4). As our loyal readers know, we analyze the Ukrainian crisis as an operation led by the US and implemented by a handful of well-placed cronies in European decision-making circles with the objective, to summarize, of sealing Europe’s destiny to the Western camp’s led by the US. This operation has been run as a blitzkrieg with a total lack of response on the European side which has suddenly found itself almost at war with Russia without knowing why. When the Europeans woke up from the first shock, another battle, quite difficult to follow, took place amongst the ruling classes, between European states and at the core of public opinion between the “anti-Russians” and “pro-Russians”, but in fact particularly between the Western ideologues and the defenders of the European continent’s independence. In the last two GEAB issues we focused on the fact that the “conditions for a jolt” had been met, noting the indicators of a European regaining of control of affairs. But summer has gone by, with the loss of vigilance that characterizes this time of year. And with summer’s end we discover a rather sad landscape a priori, especially on three points: the new French government reshuffle, Juncker’s Commission project and NATO’s high Mass in Newport. We will try to make some sense of these three, events then we will review the season’s other important themes (Iraq, Brazil’s general elections, the government reshuffle in Japan) read in the light of major global geopolitical reconfiguration henceforth endeavouring to identify the indicators hastening the world’s bipolarisation – or those of progress in the emergence of a multipolar world. So we will see that it’s not only Europe which risks sliding towards the temptation of empire. Europe is playing its role in this painful birth of tomorrow’s world, but it’s certain that the increased risk of global bipolarization feeds and is fed by an ideology of power (Europe-empire) at the core of its elite (5). In both cases we believe that the politician is in the process of returning to Europe. But whether it’s the first or second scenario which appears, this politician won’t have the same characteristics of course. Both sides are currently facing off in the EU’s corridors of power, both at national and European level. We believe that the Europe-empire track is in the process of gaining the upper hand but have not yet despaired of seeing Europe-community win ultimately. Yes, the EU is exploding. We have already amply described the challenging of numerous policies by the member states, in particular the free movement of goods and people in the Schengen zone (7); or further, the UK’s project to leave the EU, a structuring power of the EU since its birth in 1992. We must now add the likely breakup of the UK caused by the Scottish referendum to this list. Many months ago we took the risk of anticipating a victory for the “yes” vote. Now, we offer a further anticipation: whether the yes vote wins or not, in any case this referendum will transform the UK. London had hoped that a resounding victory for the no vote would reinforce the kingdom’s union but, with the certainty of a very tight result, Cameron has already had to make so many concessions to the Scots (8) that the other members of the union (Wales and Northern Ireland) are already on the starting blocks to get the same advances in autonomy (9). That said, in line with the principle of political anticipation according to which major trends shouldn’t be blocked but exploited, we believe that the UK would benefit from a shift towards a federal structure. We have often said that centralized countries are no longer adapted to the challenges of the 21st century world. Besides, the English are opportunists and know how to bounce back. By way of proof, the turning round of their financial centre towards Islamic bonds and the Yuan (10) which is saving the City. Federalization of the UK would give its elite a good opportunity to show how capable they are of taking advantage of such a twist of fate. Anyway, federalization of the UK changes the game considerably for the EU. The EU is equally in danger of splitting on its Eastern front. Today, in effect, the EU in crisis seems less and less attractive to the Eastern countries and some, without questioning their European affiliation, are starting to pay attention to what’s happening with the previous invader, Russia. Victor Orban’s Hungary is the furthest down this path and we would do well to look at the ideas of this policy in more detail, which has nothing of a dictator about it, even if he has the air of a strongman about him, concerned for his country’s independence… But in Europe these last few years, looking towards the East has been considered high treason. Others, in the light of the clear European political weakness particularly in terms of security and defence policy have, for example, set about discussing their own defence system amongst themselves. Thus the Visegrad Group (whose members include Hungary, but also Slovakia which recently said that it didn’t want foreign troops on its territory (11)), has been working for several years to put a defence and security system in place which, in a way, makes them autonomous (12). We are at this point now clearly as a direct consequence of the EU’s incapacity to offer any sort of European defence project likely to reassure countries of Europe’s borders. Bulgaria, now wants to cooperate with Russia in the construction of the South Stream gas pipeline which bypasses the Ukraine. But since the Ukrainian crisis Brussels has prohibited it from building its section (13). However, Bulgaria has two interests in its construction: first, it guarantees it an energy supply and second, it adds a not insignificant source of financing thanks to the collection of tolls on Russian gas. Eastern European countries’ participation rate in the last European elections is a clear indication of the extent of the failure in integrating these countries. Integration took place too quickly on purely mercantile and not political considerations, these countries often mixing the objective of EU integration with that of NATO integration; as for economic union they have often experienced it, rightly, as an invasion of Western businesses that destroyed their local economy. If the Ukrainian crisis perhaps provides an opportunity to establish a European defence in the remaining hope that it should be done in consultation with and not opposition to Russia, any failure on this point leads us to a view that certain countries will between now and 2020, which again would be a big failure for this EU which has continued to enlarge Europe in rejecting any project to increase integration, especially political and democratic. (1) Normally we choose a scenario, but in this case we haven’t. We have left our readers to make their own choice. (2) A word which often appears in the GEAB; in 2013 especially. (3) And which deserves re-publication halfway through the period covered (2010-2020), a re-publication which the editor, Anticipolis, has agreed to undertake. A re-reading of this book in the light of the dramatic events which dominate the news in 2014 does not encourage optimism. (4) In fact, the European construction project ground almost completely to a halt after the Maastricht Treaty: with economic union achieved, the only future project which has emerged since is monetary union whose implementation necessitated a continuation of the work towards economic governance, tax and political union, and democratisation. But we stopped in midstream… and the flood is arriving. 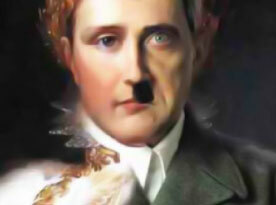 (5) The historical parallels are many. Parallel with the Soviet Union: the Western powers that are no longer leading the global economic race and who, like the USSR in the 50s prefer to build a wall between them and judged this competition unfair; but also parallel with the rise in Nazism: a capitalist economic-political system whose excesses provoke strong rejection and gradually develops the ideology of power justifying the concentration of power and money characteristic of its functioning. Just as the Nazi ideology was in effect really shared in all the European corridors of power and not only in Germany, the ideology of power peddled by the US attracts many Europeans close to or within the corridors of power, in particular in Brussels (but not only). After all, this sort of ideology was European before being American and the people who supported it consider that the US is only an extension of Europe and that the two must unite indissolubly to defeat China’s emergence in particular, who frightens them most of all. Thus, one can suspect certain European technocrats of seeing the signing of the free trade treaty with the US as a natural enlargement of Europe to the US…from the Rockies of Europe to the Balkans! (6) In many previous GEAB issues we anticipated this explosion of the EU, whilst showing that the EU wasn’t Europe, that it was a form of organization born of the Maastricht Treaty, which had failed, and that one could positively welcome the birth of Euroland in the end of the EU. This emergence of a European project alternative to the EU started with the management of the Euro crisis which has, in effect, accelerated the structuring of a Eurozone governance. But if a Euro crisis naturally reinforced the Eurozone, a geopolitical crisis like the one created by the Euro-Russian one, reinforces the EU… and all its faults.